Discussion in 'Aquarium Plants' started by Herkimur, Apr 8, 2017. Would you guys buy this? It looks OLD and is magnetic!!!!!? Depending on what you want to plant, sand with root tabs is much cheaper. Thanks for the quick reply, care more about health and vitality of plants then money atm, I went the cheap route before and that didn't turn out to well. Is this magnetic stuff going to mess with the motor of my canister below? I used it and it was a complete disaster. I would advise you not to use it. It was the reason I had to tear down the 44 project. I am still bitter about it. Says it contains heterotrophic bacteria. Within a month there was a pail green slime all over the substrate. Nothing I did stopped it. There is no chance that I will ever use a product from that co. again. I just actually talked to an honest sales person and he said because of the magnetic properties and my canisters motor being 4 inches from the soil, I should stay away from it. Yeah the guy said this green slime is the wrong kind of bacteria. It's even already in this bag here. Just nasty. The new bags don't show it yet, but an old display bag is 'blooming'. @Thunder_o_b beautiful tank to have to tear down what is the small sword you have front middle? 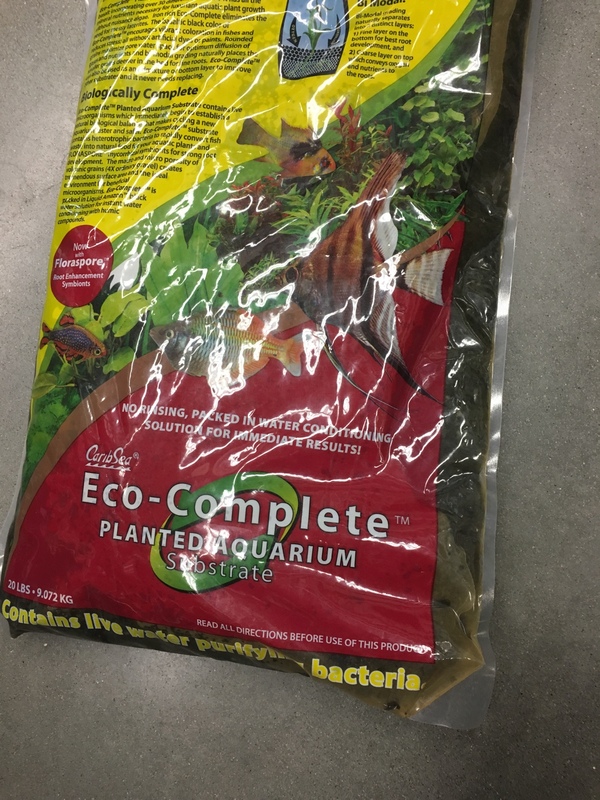 I've decided not to buy it because of the magnetic heavy metals, the wrong kinda bacteria and the added algae feed they put in there for the sludge bacteria to munch on so they don't die. This algae is what ends up blooming. Too bad because now I don't know what to use....gah ! What kind of plants are you trying to grow? I can not believe that in this day and age a product like this is still being sold. Jungle Vall and some shorter grasses, dwarf swords? Can't remember the correct name. Those should all be fine with sand and root tabs if you wanted to go that route. Oh ok. Thanks for that info. I was under the assumption that Vallisneria is a heavy root feeder and needed a specific substrate to thrive. I think Cory from Aquarium Co-Op said that somewhere. If I can't find another plant substrate that's black in color I'll definitely go with black sand + root tabs. Nope! While vals are root feeders, they're fine with root tabs in the substrate! You can also go for other plant substrates such as fluval stratum. Much more expensive, but they are more nutritious than sand and give a natural "dirted" tank look without the dirt. Thx for that tip. I'll definitely have a look at it. Think it alters PH though. It does, which is good for most fish besides livebearers and cichlids.